The Green Turtle Bay Vitamin Co.
Free of sugar, yeast, wheat and iron. Someday ….you’ll slow down …eat all the right foods …have energy to spare. Until then, reach for PowerVites ! 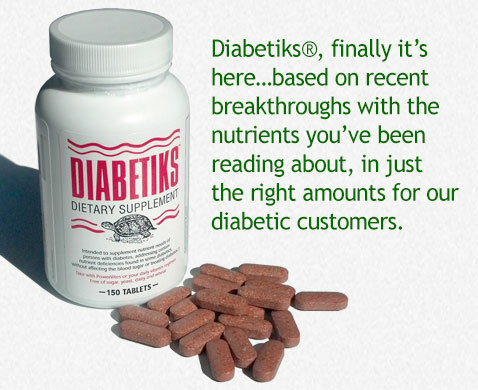 Diabetiks -- The only FDA authorized supplement for people with diabetes. We recognize that people with diabetes may experience nutrient deficiencies and supply these nutrients in this bio-active formula. When you are getting the proper nutrition, you feel the difference. Take Diabetiks with PowerVites for your daily supplement regimen. -They are made with love and integrity for you. The Green Turtle Bay Vitamin Co. wants to be your source for specialized, vitamin, nutritional dietary health supplements and mineral supplements. Whether you are looking for stress relief or energy pills, a diabetic supplement or defense of flu and colds you will find help here. Our site is loaded with self-help information to help you on your way toward holistic healing and alternative therapy treatments. Here at The Green Turtle Bay Vitamin Co. we believe that due to the decreased nutritional content of everyday foods from mass produced agriculture, everyone needs a good quality, energy multi-vitamin, nutritional dietary supplements and mineral supplement. Our PowerVites* is your multi-vitamin answer. It is made with fresh nutrients (we manufacture our products in small batches) formulated in a base of stomach friendly organisms to help you absorb these nutrients. There is no iron in PowerVites*. If you need iron, and most people do not, it should be taken in between meals with perhaps a cracker. Some people are concerned about building their immunity, particularly in the autumn and winter. For this we have an herbal anti-oxidant formulated to boost the immune system. It is called PowerMate* as an add-on to PowerVites*. We believe all people also need an omega oil supplement. Signal369* is a premier blend of omega oils 3 (fish oils), 6 and 9 to give you these essential fatty acids in the right proportion to each other. These are nutrients that support healthy joints, brain functions and digestive track. Some people like taking a fine Evening Primrose Oil*, and Omega 6 essential omega oil used as a tonic for inflammatory conditions and premenstrual tension. For selective conditions we have PowerSleep* sleep tablets with nutrients to help you sleep like a baby; Sunnie* to help relieve stress (particularly helpful for people who are unable to take an antidepressant drug), and Diabetiks* formulated with nutrients in which many diabetics are deficient. 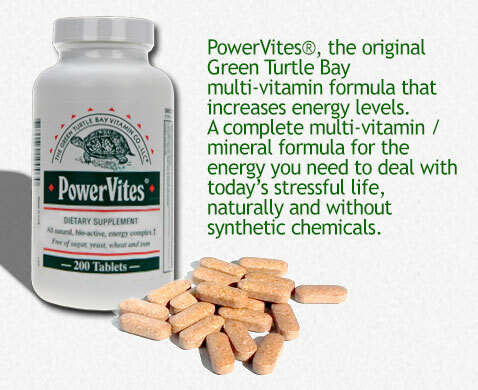 *PowerVites, PowerMate, Signal369, PowerSleep, Sunnie and Diabetiks are registered trademarks of The Green Turtle Bay Vitamin Co., Inc. located in Summit, NJ. EnergyWave is the official website of The Green Turtle Bay Vitamin Co., Inc.
Energywave.com offers nutritional, dietary, health supplements and vitamins, and holistic healing information. The first FDA authorized multi-vitamin supplement for diabetics. We take care of your health with our vitamins, herbal and nutritional dietary supplements. Find alternative therapy information and treatment for all your health problems. Find information on health and nutrition with vitamins and dietary supplements at EnergyWave. Holistic healing is therapy for the body as a whole. When your body is in harmony you have achieved holistic health. Making sure that your vitamins and minerals are in the correct proportions is one aspect of holistic healing. To that end we have made available to you information in our About vitamins, minerals and herbs section. Looking for products that are lactose, gluten or iron free? Our Products are gluten and iron free. They are also lactose free with the exception of Maple Melts which does contain lactose.